Rabbi Shlomo Amar was born in Casablanca, Morocco, and immigrated to Israel in 1962 at age 14. He was a close associate of the spiritual leader of the Shas party and former Sephardi Chief Rabbi, Ovadia Yosef. Before his appointment as co-Chief Rabbi of Israel, Amar had served as the head of the Petah Tikva Rabbinical Court. He was elected Chief Rabbi of Tel Aviv in 2002, the first sole Chief Rabbi of the city. He served as the Sephardic Chief Rabbi of Israel and the Rishon LeZion from 2003 to 2013. 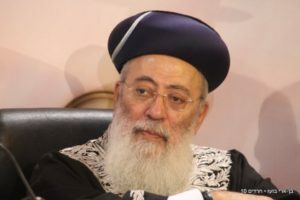 Rabbi Shlomo Amar is the current Sephardic Chief Rabbi of Jerusalem. As the former Rishon LeZion, Amar served as the spiritual leader of the Sephardic community in the Land of Israel. Jews from around the world continue to look to him as a leader. In 2004, Amar traveled to Portugal to celebrate the centennial anniversary of the Lisbon synagogue Shaare Tikvah. During his stay, Amar met descendants of Jewish families persecuted by the Inquisition who still practice Judaism (Bnei Anusim) at the house of Rabbi Boaz Pash. This was an historical meeting that had not happened between a Chief Rabbi and Portuguese Marranos (Bnei Anusim) in centuries. Amar promised to create a committee to evaluate the halakhic status of the community. Due to the delay of the committee to do any work a second community in Lisbon, Comunidade Judaica Masorti Beit Israel, was later established to ensure the recognition of the Bnei Anusim as Jews.